I recently read an op-ed in New York Times calling the times we live in The Great Unraveling. This is not a political site, so I won’t cite the reasons why, but given the speed with which information travels these days, it may seem at times that we are besieged by bad news. 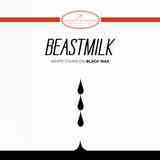 I am yet to hear Climax by Finnish post punk troupe Beastmilk, but if you believe you are on the verge of apocalypses, their original 2010 demo White Stains on Black Wax and 2012 7” EP Use Your Deluge will be the perfect soundtrack to the impending catastrophe. I am going to post this review twice, for either White Stains on Black Wax or Use Your Deluge, since these were separate independent release back in a day, and they are re-issued as separate releases now, due to popular demand. I guess the audience for apocalyptic post punk is ripe and growing. Apparently, there is plenty of disaffected urban youth who can delve into downer stoned death rock Beastmilk purveys and find either relief or absolution here, or, perhaps, on the opposite, the confirmation of hopelessness and despair to their ongoing mental stress. Whereas, White Stains on Black Wax is by nature of being an original demo is a little rawer in sound, The Wind Blows Through Their Skulls is an absolutely epic and delectable in its obvious melody. Blood Under the Mill is more twisted and dissonant, dovetailing into the radio-nightmare bizarre band eponymous track. If White Stains on Black Wax raised the banner in this world gone mad, then Use Your Deluge is where Beastmilk reached its apogee. Urgent, droning, ominous and pulsating, prodded on by simple steady rhythms Void Mother and Children of the Atom Bomb continue with this strange pang of sadness giving liberation at the same time. Drawing from the early Misfits and Killing Joke, Beastmilk are probably going to sound very familiar to the fans of unknown to me other Finnish post punk bands, but they also remind of the latter day Cemetary, just before Mathias Lodmalm devolved it into Sundown. The withdrawn morose vocals by Beastmilk’s vocalist Kvohst will give you the creeps. Slower, more static, but no less impending doom invoking Red Majesty may actually even deal with Russian modern or recent day reality, given the lyrical bits I can decipher and allusions to Kremlin. Climax next on my to hear list, I like myself calling Beastmilk the Soundtrack to the Great Unraveling so much I am going to repeat it again.